I got to spend a few weeks this August doing my very favorite activity: playing field assistant for a friend in a beautiful place. The closest I get to fieldwork for my own research is interviewing fishermen—fun and exciting in its own way, but it’s still a treat to put on my ecologist hat (or rather, mask) and jump in the water. 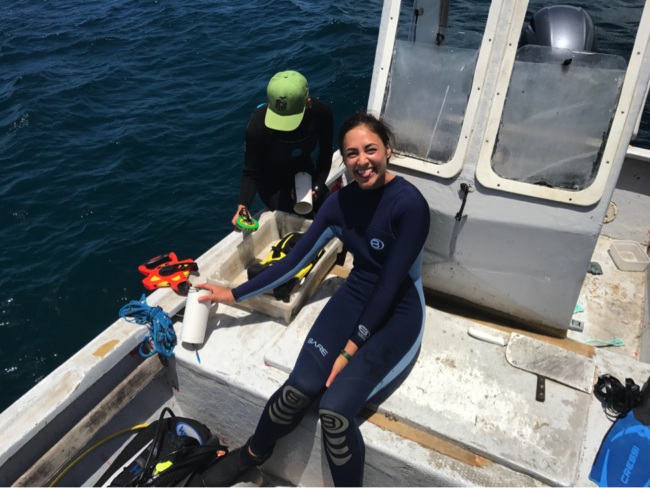 My friend Molly Wilson, a PhD student at UC Santa Barbara, studies how parrotfish behave in heavily fished areas, and how that in turn affects coral reef ecosystems. Parrotfish are voracious grazers, mowing down the algae that can overgrow corals, making them a key player in coral reef health. But, most of the studies of parrotfish grazing have been in areas where they aren’t fished. Molly works in Antigua and Barbuda, where parrotfish have been harvested with nets and spearguns for generations. Not only does fishing reduce the number of parrotfish, but it might frighten the fish into spending less time grazing, so their effect on coral health may not follow the same pattern as other accepted models. Ari, another parrotfish team member, and I set up our field equipment—transect tape measures, a weighted line, and data sheets. Photo by Molly Wilson. For me, this meant warm, clear, Caribbean dives for two purposes: cataloguing the state of the ecosystem and observing parrotfish behavior across sites with different fishing intensity. 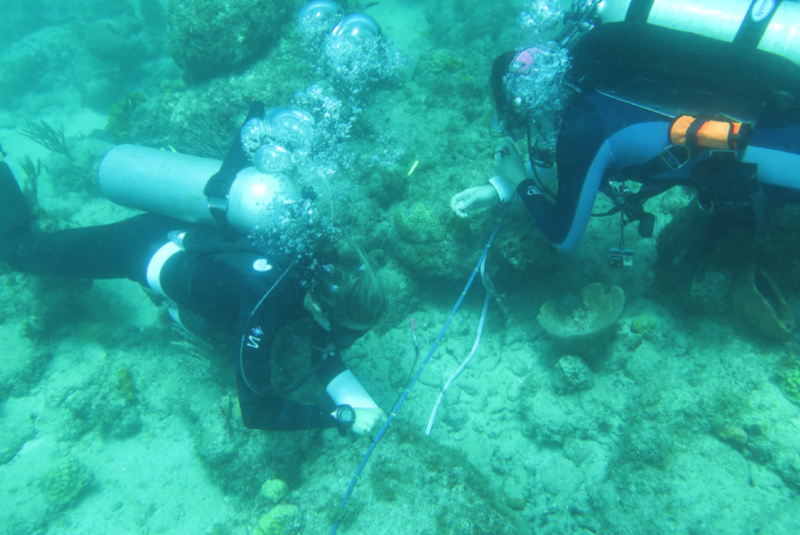 During the ecosystem survey dives, I was in charge of recording the benthic substrate (the coral reef floor). This involved bobbing along a 10-meter lead line, recording what was underneath it every 10cm. In a thriving reef, I would expect to see plenty of live coral cover, with some fleshy macroalgae or scrubby turf algae (both parrotfish lunch), or other encrusting invertebrates like sponges. Instead, my data sheets were filled with turf algae and macroalgae, and very little coral. Molly catalogued the diversity, abundance, and size of fish on the reef, and her results were similarly discouraging. There were plenty of fish, but most of them were tiny juveniles, a sure sign of missing predators. Big grouper, snapper, and sharks are the hallmarks of a flourishing food web, and we saw hardly any. To study parrotfish behavior, we used a method called “focal follows:” we would pick a parrotfish and follow it around (at a respectful distance) for two minutes, recording how much time it spent swimming vs. eating, and how many bites of algae it took. As it turns out, parrotfish can cover a lot of ground in two minutes! I record the benthic substrate at every 10cm interval marked on the lead line while Ari measures the rugosity, or structure, of the reef. Photo by Molly Wilson. Where the benthic dives were plodding and systematic, the parrotfish dives were a frenzy: frantically counting bites as the parrots dipped below the reef or weaved through schools of identical friends. 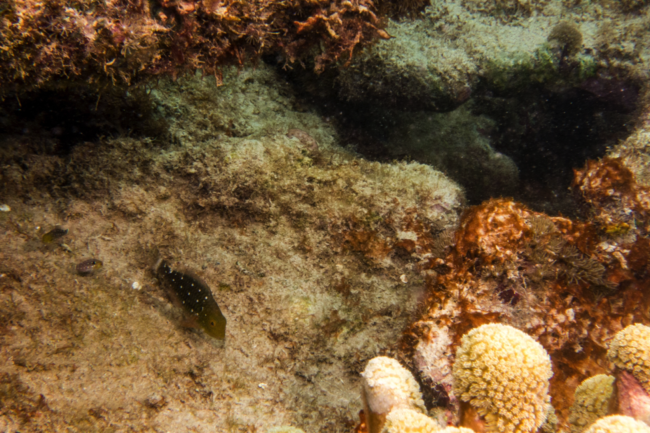 The fish were noticeably wary of us, and spent much of their time cowering under coral ledges. Even in Barbuda, where a spearfishing ban was implemented in 2015, the fish were furtive, not the carefree chompers we would want to keep the reefs clear of algae. Of course, parrotfish fishing isn’t the only factor to blame for the conditions we saw. The Caribbean’s coral reefs have also suffered from development, a sea urchin disease, nutrient runoff, and warmer ocean temperatures over the past several decades. 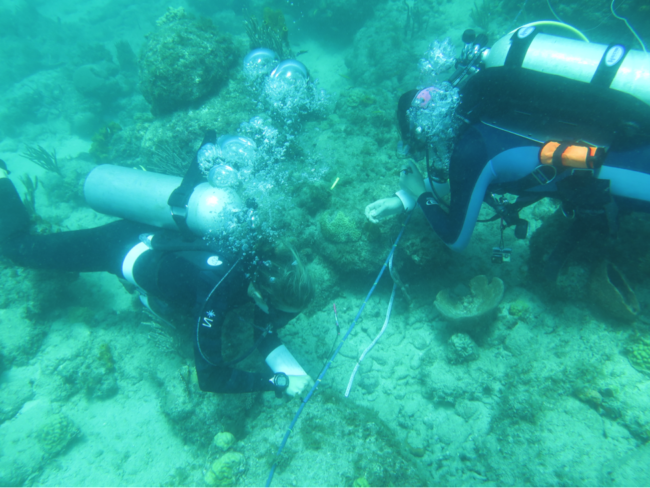 In Barbuda, the reefs we surveyed were the ruins of staghorn coral tumbled by a big hurricane in the 1980s, completely grown over by algae. The cumulative nature of these stressors makes it all the more important to understand what we can about how they impact the reefs, and what policies might help ameliorate them. A juvenile stoplight parrotfish eyes me warily. Behind it are mats of turf algae coating dead coral, a common sight on our survey dives. Photo by Julia Mason. Fourteen dives, a flurry of data entry, and countless perfectly ripe mangoes later, I was on a flight back to Monterey’s coastal fog and my R code. Another two weeks after that, Hurricane Irma ripped through the Caribbean, drenching Antigua and destroying every bit of infrastructure on low-lying Barbuda. I’m heartbroken for the family of the little girl who passed away, my friends on Antigua, and all those affected by Irma and her successors across the Caribbean. As communities recover and people’s needs are attended to on land, I’ll be curious to see how these storms affected the reefs. Clearly, it took over 30 years to recover from the last major hurricane, and as we see storms increasing in intensity as the climate changes, without strong coral reefs to blunt the forces of the storm, I fear that these catastrophes will become more common. I’m heartened by what I hear about the resilience of the Barbudan people and the strength of their communities, and I wish them the best as they rebuild. 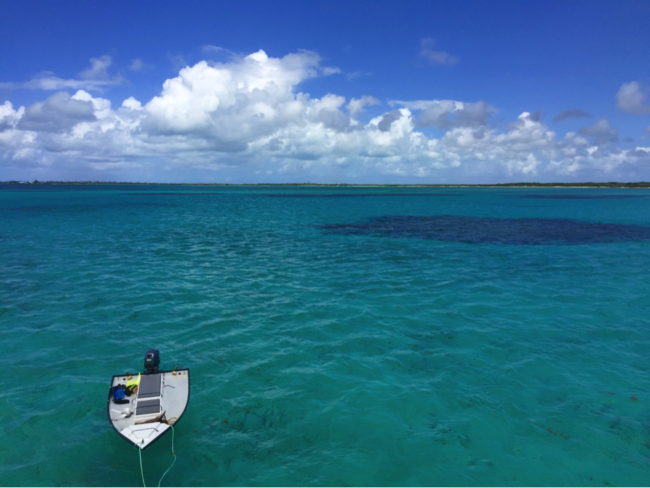 Our “office view,” just off Barbuda. Photo by Julia Mason. Julia Mason is a PhD candidate at Stanford University’s Hopkins Marine Station. Her research is on the effects of climate variability and management on the social-ecological resilience of fisheries in California and Peru. She is interested in dynamic management approaches that protect highly migratory species and fisheries livelihoods in a variable, changing climate.